I consider the modern motor vehicle an incredible instrument of precision engineering. The advancements in technology will always remain an never ending journey. My fascination remains stronger than ever…. !! Its a tough school for vehicle manufactures with so many competitors in the game now and combine this with current technology and consumer demands, the cars we drive just keep getting better. What an amazing time for us at this point in the evolution of the motor vehicle. “Cars are awesome” that now allow us to truly enjoy the experience of driving…. We must never forget or refuse to appreciate the effort of the many millions of dollars that go into the development of the motor vehicle…… There are some clever people out there who design and build cars with the final blue prints signed off on after exhausting and years of testing…. This all happens well before a motor vehicle “released to market date” As vehicle modifiers & repairers we must always remain conscious of this with our work and never let it be our “foolish undoing” to ignore or under estimate the extreme importance of the modifications and adjustment choices we make to improve our motor vehicle when so many million of dollars have been spent before us. All to often I witness vehicles being ruined, made incredibly unsafe and see clients heart felt best intention’s fall well short of their targets or even the performance of their cars take several steps backward as part of their quest for improved vehicle handling and lap times. Why….?? Because this is a serious business and when we start the game of modification and performance it can either go very very well or very very bad….Whilst a great / winning car is a package of everything working well together, my focus hear is on the aspects of steering and suspension………… which is all to often remains low on the priority list and very much misunderstood. Off on a tangent for a moment as I grapple with this from another angle….. Within the racing and performance game there is nothing quite as exciting as a chassis dyno print out showing that your engine just made a phenomenal power output figure. That takes absolutely nothing away from the dyno tuning personal. 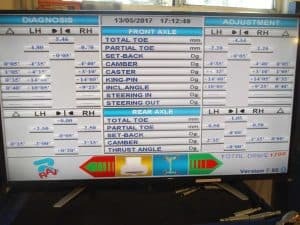 Though try and build even a fraction of that enthusiasm into an awesome wheel alignment printout and mostly it remains a failed mission and a hard perception to break….. When a car is designed it usually starts with the choice of tyres then the process begins…. so lets put a little of that way of thinking into our game plan….. start from the ground then the only way is up…. I wish to intervene at about the suspension part…. The stress’s placed on components during race conditions really takes takes us to another level where there is no place for low quality, inferior products & parts….. though this only half the battle…. what you do with these parts, the knowledge you have and choices for set up & adjustment is the other half. And its going to be the “game changer” “The Power in Set Up” will be the “Game Changer” All the best in parts in the world will not deliver if the set up & tuning of the chassis is not strongly considered & implemented to the highest standard with the finest attention to detail given. It would be no different if you were installing a high performance camshaft, ported heads and exhaust headers to any engine, then not finishing it all off with an engine tune…. you just wouldn’t do it….!! The engine may start & run…. look good, have a choppy idle though be terrible to drive with little or no power increase and may result in a cataphrophic engine failure at wide open throttle / race conditions. The same line of thinking must apply when you install a set of coil overs, adjustable alignment suspension components, R Spec tyres & more to your to spirited street or track car…. Fitting the coil overs and components is the easy part…. 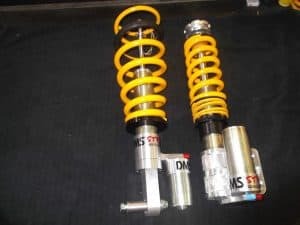 this must be complimented with a precision set up….. Its this operation that will transform your car and release the full potential of the quality coil overs and suspension parts you have spent hard earned money on…. There can be no exception to this….!! Typical case study….. A Nissan 180SX is presented to the workshop with a treasure box full of the best money can by…. The list goes a bit like this: coil overs, camber adjustable front lower control arms and strut rods for caster. going to the back I have new toe links and adjustable camber & traction rods and finally a set of blade adjustable sway bars and heavy duty adjustable links…. Out of the box, nothing is adjusted…. in fact its all closed down, collapsed to fit into small shipping box’s and all you have is at best a few generic instruction sheets. In any case and its no different in the workshop, we are basically starting again…… Once the parts are installed and even after our best educated guess, at this point we don’t even know that when we lower the car off the jacks that the car is going to look like it has a lift kit or sit on the chassis rails and every wheel will be running to a different trajectory ….. with experience I have established base line settings though it is at this point you take a deep breath, muster all you patience then focus on the roll out of a full set up street / track car…. Its certainly isn’t as easy as just fit the parts & drive away…. its so much more than that… Its a matter of bringing it all together…. “The Power in Set up” With the 180SX…. 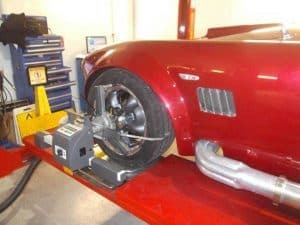 it would go something like this….. work hard on ride heights though making sure your wheel alignment is not to far off the mark during the process …. You cannot accurately set your ride hieghts if you have 6 degress neg camber & 20mm toe in, when your target is 3 degrees and 3mm toe out…. Its very much a balancing act and you need to avoid unwanted bind up or stiction in the suspension during these critical phases. Then correctly after each adjustment you need to drive the car around the car park to resettle the suspension before your next measurement. 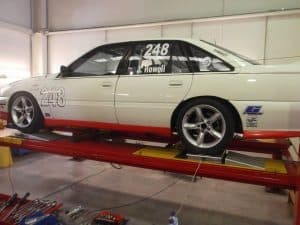 Consideration must be given to weighting for a race car, driver ballast and average fuel loads must be considered, the choosen tyres for the application fitted and tyre pressures set. The ride height settings should take into account the angles of your control arms etc to ensure best and favourable camber curves… and of course if you are corner weighting the car you then have this further element thrown into the equation where you juggle ride heights & corner weight target measurements for the best possible outcome. Alignments must be carried out per application and one of the final tasks is to install sway bar links with the vehicle at ride height to ensure a neutral sway bar loading with no corner load…. Of course there is much more to this if you are really getting serious. Say, checking bump & droop of your damper…. bump stop consideration and still there can be more operations & aspects to consider. Then its only at this point you are ready for road trials….. where you can also carry out some base line damper settings…… Of course….. if the car is used for track work….. you have just reached a starting point for testing & tuning under race conditions…. Yes, accurate chassis tuning / set up really keeps you busy The strong point and primary reason for my words today is you must never underestimate the potential yield from suspension performance that will be released via time spent on you Set Up…… Its everything & Its bloody powerful……!! So why not try and be our own Vehicle Development Engineers….. If so much time and money is spent chassis tuning motor vehicles by vehicle manufactures before we see them appear in showrooms, shouldn’t we equally be trying to think the same way and applying the same mindset when we choose to go racing and apply far greater stress’s that were originally intended to our vehicles and chassis platform…… ?? My god, there can be only one answer to this. Play the game safely and play it professionally all the way from the ground up….. Quality components complimented with excellence in Set Up ………! !